First launched in 2003, the Cayenne has become the World's best selling Porsche. To celebrate the popularity of its most versatile model, Porsche is holding complimentary service clinics across the country on March 5, to ensure that the car’s exceptional performance continues to delight its drivers both on and off the road. The national Porsche Cayenne Service Clinic provides owners with a complimentary inspection of their car and the opportunity to accompany the technician in the state of the art workshop at their local Porsche Centre. Cayenne Clinics will provide customers with information and advice to ensure that the expected safety, reliability, and performance levels of their cars are maintained. Each customer attending the Cayenne Clinic will automatically be entered into a prize draw, within their Service Centre, to win a bespoke ‘all-wheel drive day’ – featuring 911 Carrera 4, Panamera 4 and Cayenne – at the Porsche Experience Centre, Silverstone. There is a driving day available at all 32 participating Porsche Centres nationwide, so each eligible customer has a great chance of winning. The Cayenne Service Clinic follows the highly successful 911 Service Clinic held in October last year, during which over 500 Porsche 911s were inspected in Porsche Centres across the country over the course of the day, giving owners a chance to learn about the more intricate nature of their cars. 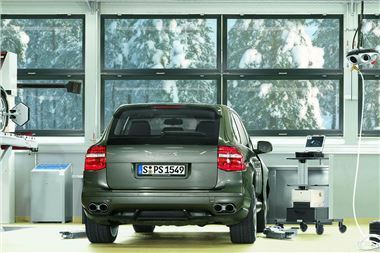 Porsche Cayenne Service Clinic inspections are by prior appointment only, and available on a first come first served basis. To learn more about the Service Clinics, owners should contact their nearest Porsche Centre or call 08457 911 911.